grandma's cookie jar: What is Your Favorite Cookie & Please Help Spread the News! What is Your Favorite Cookie & Please Help Spread the News! What cookie do you make the most for your grandchildren? At my house the favorites are straight up peanut butter and peanut butter toll house! This is from my new facebook page for Grandmas with Heart. 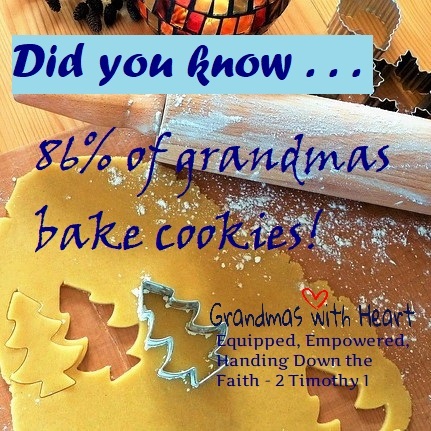 A group of grandmas - Linda Ransom Jacobs, Sherry Schumann, Cathy Jacobs, Deb delVillar, Naomi Murray and myself - have joined together to produce resources which will equip and empower grandmas (and grandpas and parents) to hand down a heritage of faith. We are working to find publishers who will "get on-board" with us so this project will be able to move forward - it would be tremendously helpful for as many people as possible to "like/follow" the Grandmas with Heart facebook page (https://www.facebook.com/Grandmas-with-Heart-130560861034115/) and our twitter account (@gm2heart) Please help us spread the news!